Thanks for linking up with us every week for FMBT. :) Have a great week !! Thanks Following you back too! Hi there! Thanks for stopping by my blog, leaving a comment and then deciding to follow me! You are so sweet! I too, enjoy finding other military spouses, I can definitely relate, you know? It's like a separate community :) I really like your blog and will continue to check back for new updates and posts :) Take care! Following you!!!! Your blog is so cute! Love the palm trees and the colors! Thanks for stopping by! HI hope you are having a great Tuesday. I am already following you too. I LOVE your blog design it is too cute. Thanks for visiting my site! 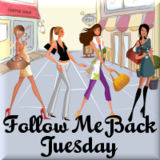 I am following you back from Follow Me Back Tuesday! THank you for stopping by my blog and following. I am now following yours and looking forward to your future posts. Hi!! Cute blog :] I'm following you back! Hey there! I just LOVE the palm trees! Following you back! Following you from FMBT! Please stop by Dropped Stitches to follow me back! Love the cute theme of your blog. I'm following you back and looking forward to reading more of your blog.